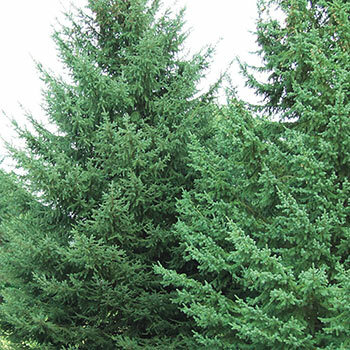 While you may plant Black Hills Spruce so that it someday blocks the wind, provides you with privacy or serves as a specimen tree, you'll also be cultivating something for future generations to enjoy. This variety usually lives for 250–300 years, grows to 30–50' in height and produces a dense covering of green to blue-green needles. It's tolerant of heat, cold, wind and drought. This evergreen even indulges being crowded by other trees. Get it started in your landscape this summer because we're shipping it now, garden ready, in a gallon pot. Planting Instructions: Can be used as a windbreak or screen. Plant before new growth buds break open or after they harden off in late spring. Soil Requirements: Well drained soil. Does not do well in heavy clay soil with excessive moisture.